Published: Sept. 16, 2018 at 01:43 p.m.
Tennessee Titans wide receiver Taywan Taylor jukes defenders and scores on an 18-yard touchdown pass from quarterback Blaine Gabbert. 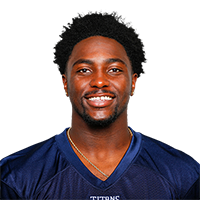 Published: Aug. 18, 2018 at 10:11 p.m.
Tennessee Titans quarterback Blaine Gabbert finds wide receiver Taywan Taylor open for a quick 3-yard touchdown. Published: Aug. 18, 2018 at 08:44 p.m.
Tennessee Titans wide receiver Taywan Taylor turns on the jets and takes it up the field for a 47-yard touchdown. Published: Oct. 17, 2017 at 12:10 a.m.
Tennessee Titans QB Marcus Mariota dials long-distance to wide receiver Taywan Taylor for huge TD.